Make the most of the season, come out for networking, food, and holiday cheer in these unique business events. SHIP BOTTOM, N.J. - Nov. 20, 2018 - PRLog -- Before 2018 winds down, Southern Ocean County Chamber of Commerce invites local business people to be merry and get creative during the month of December. The regional chamber and its members will be hosting two holiday After Hours events. The first will take place on December 12 from 5-7 p.m. at SwellColors Glass Studio, located at 1715 Long Beach Blvd in Surf City. Local business owners, chamber members and artists are welcome to attend for networking and making a fused glass ornament. Enjoy light refreshments, a fire-pit by Hard Life Concrete, music and holiday cheer. Swell Colors has recently been accredited as a Southern Ocean Made business, and will provide this hands on class for attendees to take part in. Then on December 17 from 5-7 p.m. the Southern Ocean Chamber and Little Egg Commercial Revitalization Board will co-host a mix and mingle event at Pine Cone, Too located at 980 Radio Road in Little Egg Harbor. Network with fellow businesses while you treat yourself to delicious refreshments and good cheer. Both events are free with your rsvp to the chamber. Call (609) 494-7211 or email info@sochamber.com. 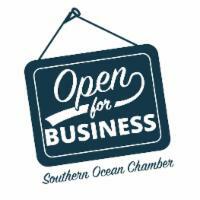 The Southern Ocean County Chamber of Commerce has been serving businesses and their customers since 1914, and is globally accredited Destination Management and Marketing Organization. It operates a year round visitor and commerce center at 265 W Ninth Street in Ship Bottom, can be reached online at www.visitLBIregion.com . The Southern Ocean made program and it's award winning Surf and Sip Brew Trail is also represented on www.southernoceanmade.com . For more information on the dozens of programs and events held through the chamber each year, contact 609 494 7211.